Pakistan Tehreek-e-Taliban Jamaat-ul-Ahrar (TTP JA) have released a video showing the group’s attack on the Ghalanai military camp in Mohmand Agency, Pakistan. The release came through the Broadcasting department “Ihyaekhilafat” and is called “Zamaryan 11”. “Wearing suicide jackets, the attackers opened fire and tried to rush inside the mosque,” the ISPR said in a statement. 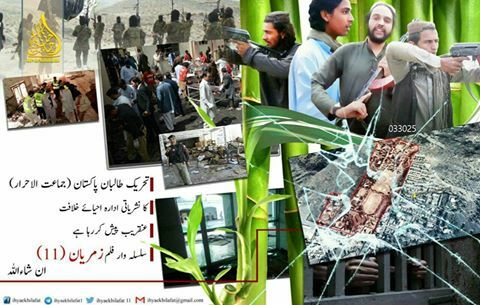 “New video of Tehreek-e-Taliban Pakistan (Jamaat al Ahrar) will soon be coming out. In this video by the Jamaat’s publication department ” Ihyaekhilafat” for their series “Zamaryan” , this will be the 11th film of the series. In this film along with great jihadi scenes, the recent Mohmand Agency headquarters Ghalanai attack footage, events and details are shown. The video begins with the beginning of Islam and Kufur conflicts as a backdrop to the event leading to the introduction of Army camp in Mohamand Agency headquarters at Ghalanai and a brief introduction of the atrocities being carried out there. The video clearly shows the map and layout of Ghalanai camp in detail and also the introduction of the four suicide mujahedeen. The 26 minute video shows TTP JA planning the attack. Five persons in camouflage outfits, faces covered in black masks in a small room painted with blue flowers examining what appears to be an aerial photo/map of the camp. A militant is later seen firing a weapon and talking to camera followed by news footage showing the bloodied floor of a mosque and rescuers at the scene. The video features clips from historic events, interviews and training exercises with weapons and has Urdu and Pashto motivational songs. The video can be viewed on the following link. In 2014 Pakistan military launched operation Zarb -e -Asb in the Federally Administered Tribal areas to drive out insurgents with some militants relocating over the border to Afghanistan. This latest video shows the capability to launch attacks on military installations remains.